The scientific name of Ackree fruit is Blighia sapida of the family of Sapindaceae. Other names are Achee, Ackee, vegetable brains or Akee. 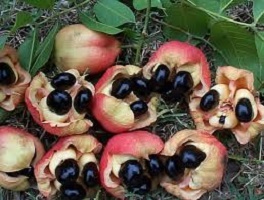 Ingenious to the tropics Ackee fruit it is found in West Africa, Ivory Coast and Jamaica. It is popular in Brazil, Venezuela, South America, Panama and Trinidad. It was brought into Jamaica in 1793 and the tree is medium to large 20m with bountiful oval canopy. It has stiff, shiny green leaflets with short petioles and evergreen. It has unisexual flowers, pear shaped capsule fruits with 3 lobes. The Acree fruit is canned, prominent in Jamaican cuisine and an ingredient in the countries national dish. The fruit is canned and a major export product. Only 10% of the fruit is edible and the rest deadly and dangerous to eat. The only edible part the fleshy yellow pulp of a fully developed fruit. The seeds are inedible and harvesting is done when the fruit opens naturally. The tissue, red veins are discarded while unripe or immature fruit is highly poisonous and toxic. Improper consumption could lead to coma and death. The flesh consistency determines the type of ackree fruit. They are categorized into smooth, cheese, firm, hard, butter and regular pulp. The trees grow in subtropical and tropical regions. Best soil quality should be moist, well drained and full of nutrients. However old trees can manage dry soil are hardy and tolerant of cold temperatures for brief periods. The tree is propagated through the seed are short lived and die within 2 days. They produce fruits in 5 years while seeds germinate in 3 months. Waterlogged areas is bad for the tree including windy areas. They need fertile, sandy, limestone, oolitic soil. The soil should be well drained, deep and the tree requires full sunlight. Use dry fertilizer, nutrition sprays, iron application. Control diseases, insect control, pruning and watering. Space them 7m from adjacent trees, away from powerlines, buildings or structures. To plant develop a nursery and grow in 10 liter container. Once the trees attain 4 feet transplant in prepared farm land. Select only healthy trees devoid of infection, diseases or damage. The site should be in a warm area with full access to sun. The soil could be Rockland soil, sandy or native to the area. The fertilizer should contain 6% phosphoric acid, 10% nitrogen 45 magnesium, 10% potash. Use nutritious spray annually, water regularly until tree is mature. Mulch to retain soil moisture and weed appropriately. The tree is pruned for the first 2 years to control the canopy spread. The only time to harvest is after the fruit splits longitudinally in a natural process. Any fruit harvested before splitting is unripe and poisonous, same applies to those split too long. The only edible part is the flesh of the yellow ackee aril after the capsule splits open naturally. If the aril is discolored or soft it is very poisonous and deadly. A commercial farm should have experienced people when harvesting. They could invest in canning machinery and focus on export market. There are strict provisions in the content of the can to ward against unripe ones in the product. To start the business the farmer needs a business plan. They also need adequate funding, nursery stock, equipment and labor. the site selection is important including weather condition and soil composition.